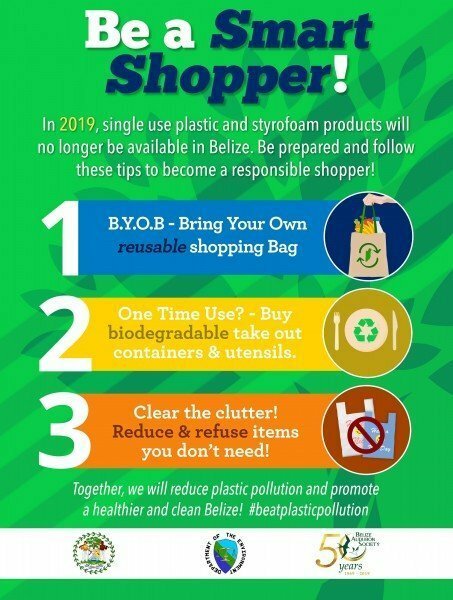 Belize is saying NO to plastics, particularly non-biodegradable plastic bags, trays, plates, cups, bottles, spoons and other containers and utensils, which will soon become illegal to import or even possess. 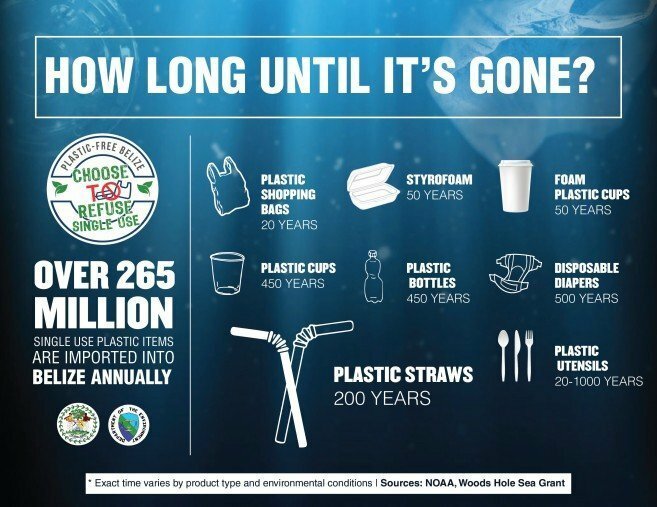 Education of the public to choose biodegradable alternatives and to switch from disposable, single-use containers to reusable bags, containers, and utensils, is key to making the program work. 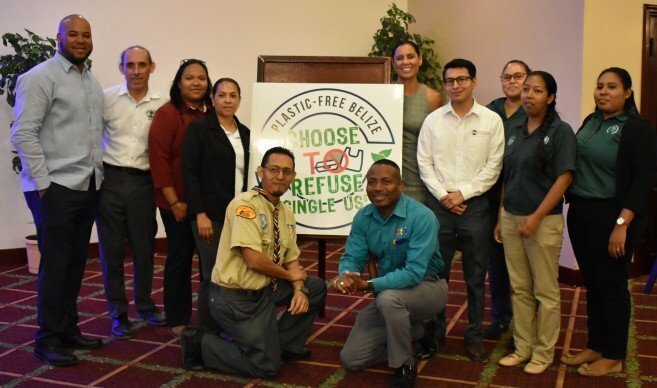 To this end, the Department of the Environment (DOE) launched its “Say NO to Plastics” education campaign at the Best Western Biltmore Plaza Hotel in Belize City on Wednesday morning, March 20th. The education campaign includes a slogan “Choose to Refuse Single Use”, as well as two locally produced television advertisements to be aired on local TV stations, and two international ads airing on American television, advocating the use of reusable bags and containers rather than single-use disposables, as well as posters and flyers, and even a music jingle composed by young Belizean artists. Interested parties from the private sector: manufacturers and importers got their first look at the draft Environmental Protection (Pollution from Plastics) Regulation; when the Ministry of Agriculture, Fisheries, Forestry, Environment, Sustainable Development, and Immigration (MAFFESDI) presented the draft for their review at a national consultation meeting at the Radisson Fort George Hotel in Belize City last Friday, March 15th. Many business entities import and manufacture these plastic items in Belize, including Styrofoam and polystyrene cups, plates and utensils, as well as the biodegradable alternatives. Participants at the consultation included Customs brokers, as well as representatives from the agro-processing sector; non-governmental organizations, the academia, the Chamber of Commerce as well as those Government departments and agencies responsible for monitoring and enforcement. 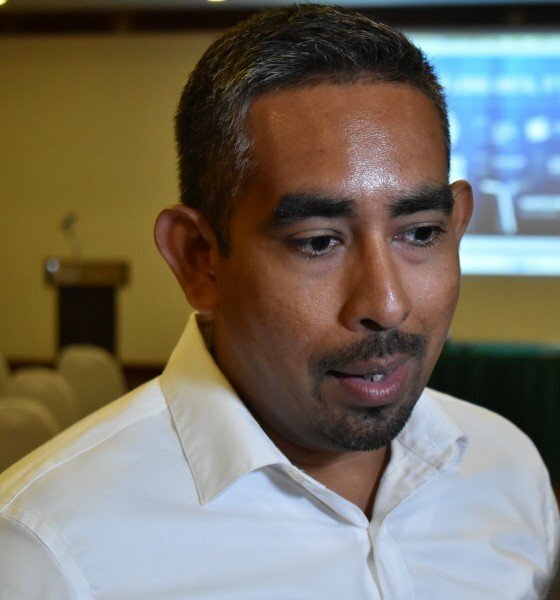 Chief Executive Officer Percival Cho said the new regulations take effect on April 22, 2019, when importation will no longer be allowed for these non-biodegradable plastic items. The program includes a gradual phase-out process up to the end of the year, and the education campaign is planned to continue for the next six months. Cho went on to say that the Ministry of Trade and Investment, in collaboration with BELTRAIDE, is in the process of preparing an incentives package to help manufacturers and importers over the hump, in terms of fiscal incentives for container manufacturers who may need to retool and import new equipment to make the new bio-degradable items, and perhaps there may also be a zero-rating in terms of taxes on the raw materials to produce the bio-degradable packaging and containers. Other non-governmental organizations such as Oceana Belize, the Belize Audubon Society and the Scouts of Belize are fully on-board with the program. Executive director of Oceana, Janelle Chanona-Coye, welcomed all comers to get with the program because the present statistics are distressing. 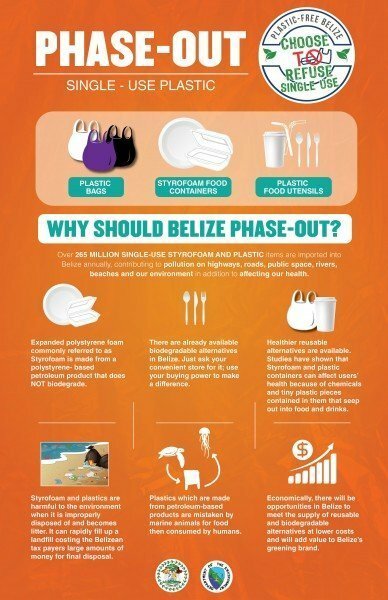 Belize imports over 265 million single-use plastic and Styrofoam items every year. Most of these end up in a landfill, where they represent 19% of the volume, and therefore 19% of the cost of national waste management. Worse, improper disposal leads to tons of plastic garbage in the environment, which finds its way into Belize’s rivers and streams and out to sea, where it creates huge problems for marine life since many organisms mistake the small bits of plastic for food while others choke to death on it. 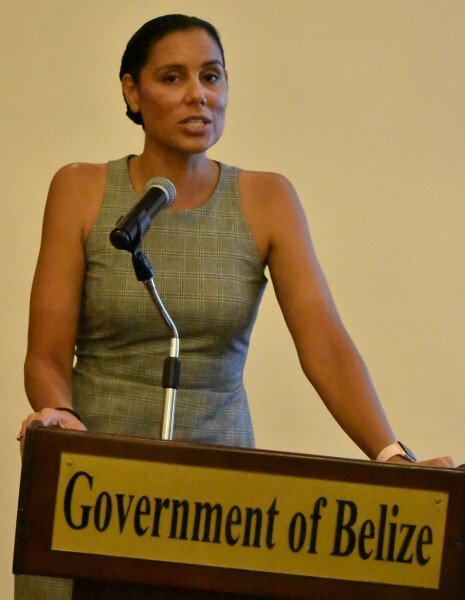 Belize markets its tourism product as pristine, untouched natural beauty, and if we don’t take a stand to stop the ugly scourge of plastic pollution, we will end up with more plastic than fish in the sea, Chanona warned. These single-use polystyrene items made from petroleum do not biodegrade and can remain in the environment for hundreds of years. Recent explorations by robot underwater submersibles have found plastics debris in the deepest part of the Atlantic Ocean, the Marianas Trench, which is 10,994 meters deep. Residents of our outer islands along the Barrier Reef are also distressed by the tons of plastic flotsam coming from passing ships, which litter all our coastal mangroves and islands - inhabited and uninhabited. The Belize Audubon Society did its part by presenting re-usable shopping bags to all participants at the launch, an example followed by MADISCO and the DOE. Each year, Audubon volunteers collect tons of plastic garbage in an annual clean-up of the George Price Highway from Belize City to Guanacaste Park, in celebration of Earth Day, April 22.